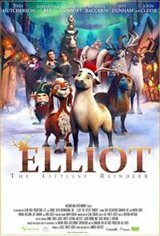 When Santa's Workshop announces that Blitzen the reindeer is retiring from Santa's (George Buza) team, miniature horse Elliot (Josh Hutcherson) sees it as his chance to become one of Santa's reindeer. With the help of his goat friend Hazel (Samantha Bee), the little horse trains hard to fulfill his lifelong dream of earning a spot alongside the remaining reindeer who pull Santa's sleigh each Christmas Eve. Elliot trains hours and hours in an effort to be able to compete at the North Pole tryouts. When he gets to the competition, he endures endless teasing from the many reindeer he's competing against, but he remains positive that he'll be chosen, despite his diminutive stature. Canadian Connection: The film is written and directed by Canadian filmmaker Jennifer Westcott and features the voice of Martin Short in several roles.